If you work in specialist sectors, you will demand the experienced and professional delivery of your integrated security, AV or fire safety systems. You will want to know that we understand your business. Our track record in working with specialist sectors highlights our ability to take care of all your Health and Safety obligations, provide the very latest in security systems, deliver high quality and expert installation as well as provide comprehensive security maintenance services. Whatever your safety or security requirements Mercury Systems is expertly qualified to meet them. As a client with very specific needs for your particular industry, you will value and appreciate the differences that set us apart. Personal, informed and responsive client service will provide you with peace of mind that you are protected. We offer our clients our skills, integrity, expert knowledge and enthusiasm to every engagement, as well as an individually tailored service to meet your every requirement. At Mercury Systems we aim to remove the risks that many businesses face in ensuring that their security and safety standards protect employees and property. 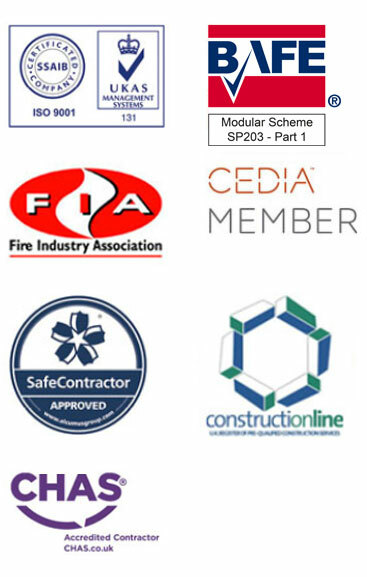 We can provide all the necessary expertise and legally required qualifications and accreditations. As a total service provider, we design, supply and install bespoke systems designed to meet your every need. This can be a stand alone or fully integrated security solution to incorporate the full range of intruder alarm systems, door entry systems, CCTV, access control and fire alarms. All of your projects will be managed ‘in house’ by our highly experienced and professional project staff that will have expert knowledge of your industry. Your project will be managed to ensure that it is delivered on schedule, within budget and to our consistently high standard. Contact us now on 01707 272272 to discuss your requirements. The support and guidance provided by Mercury Systems is of a very high standard with great attention to detail. From small works to major projects the level of service delivered is outstanding, providing a one-stop solution to all our clients security needs.